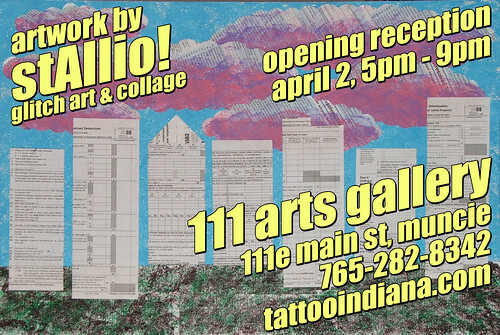 my first-ever solo gallery show—which i've alluded to in prior posts—opens this thursday (april 2) at 111 arts gallery in downtown muncie. the show will feature nine databent prints and several poster-sized collages. all art will be priced affordably (nothing higher than $50–$60), because even in these hard times it's nice to have some cool art on your walls. come on by and say hi! or if you can't make it thursday, my stuff will be up all month. Hope all is well. Hit me up sometime!